With life becoming so fast-paced, it’s important to take some time and invest in the little things. The home is, in many ways, a living being, and it has needs. It affects the tenants in a positive or negative manner, depending on the state it’s in. Everyone needs to know how to take care of their household, and the best way to start is to invest in a good ole fashioned toolbox. In many ways, the drill is the best and more versatile tool for every DIY enthusiast or home repairman. From drilling to sanding, screwing, and unscrewing, there are many projects that one can take on with the right drill. Cordless drills are much better than their power-dependant counterpart in that they allow for better angles and more flexibility in general due to the fact that it runs on batteries. If you are looking for an awesome kit that delivers superior performance and functionality, we have got you covered. 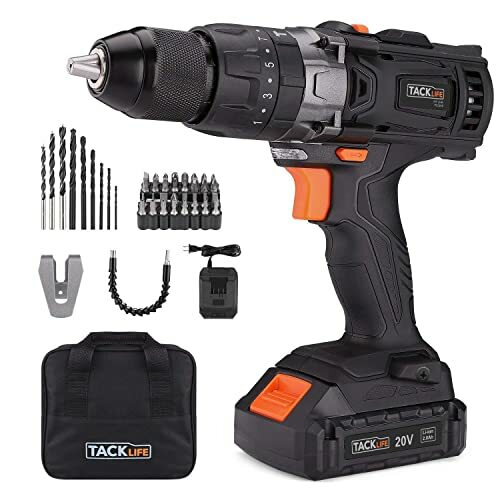 Here, we are going to talk about the Tacklife Cordless Drill Set. The Tacklife Cordless Drill comes with a half-inch keyless chuck, which usually determines which heads are compatible with the model. A half-inch chuck is great for most home projects but can be a bit too lightweight for large-scale projects. Then again, cordless power drills are not really powerful enough to drill through concrete and other heavy-duty activities. This is a basic, but a rather useful feature to have. The drill has an LED flashlight installed near the chuck area. This will allow the user to drill into poorly-lit areas, at night, and to receive real-time updates on the state of the battery, which is an important feature to have when working with a battery-powered power tool. The battery itself is a 20v 2.0Ah Lithium-ion battery. It provides the drill with plenty of juice to work on DIY projects. It also comes with a quick charging device that will have it up and running from 0 to 100% in about one hour’s time. Overall, this is one of the more important things to look for in a cordless drill, and this brings it a lot of value. 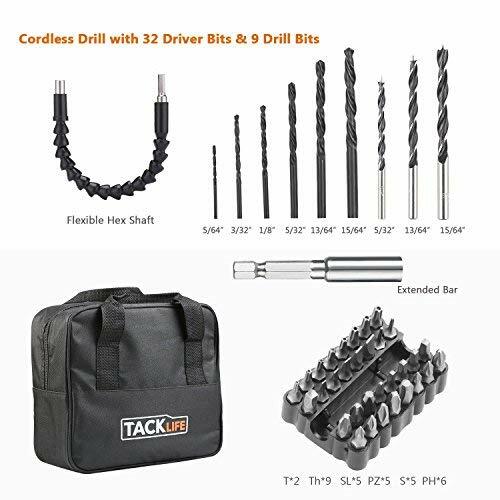 With 43 individual pieces, the Tacklife Cordless Drill set has the user well-equipped for all types of light home projects, and even allows him or her to get a taste of more heavy-duty tasks. Apart from the classic different-sized drill heads and driver bits, it also has an extension bit holder. The extension bit holder will allow the user to reach a lot of hard angles in an effortless manner. It’s a flexible extension that allows users to bend and drill precisely in different positions. It’s mostly used for driving, as the extension isn’t very accurate with higher speeds. A 310 pounds of max torque is what this puppy is capable of. This means that, as stated so far, it’s great for lightweight use around the household, but it will find trouble when being put to use in heavy-duty projects. The fact that it doesn’t have a brushless motor is a bit of drawback. Brushless motors have the ability to adjust better to the task, meaning that they will adjust their resistance and not cause damage to the motor, drills, or clutch. Brushed motors, on the other hand, tend to put more resistance on the motor and the parts because of their more obsolete design. It’s not the end of the world, but don’t be too surprised if sparks come flying out under a lot of stress. Even if it’s a more light-duty machine and even if it doesn’t have a brushless motor, users should rejoice to know that this item comes with a two-year manufacturer warranty. For a machine of this caliber, this is a welcome surprise and allows a newbie or an inexperienced amateur to experiment without a lot of stress. In such a volatile and competitive market, it’s hard for users to determine which products are good and which ones are great. When browsing the DIY cordless power tool market, one might stumble upon the TEENO Cordless Drill Set, a valid alternative to the Tacklife Cordless Drill. Let’s talk about both and see which one is better. For starters, the TEENO Cordless Drill doesn’t come with a lot of the accessories that are present in the Tacklife Cordless Drill set. No extender means that drilling at a tough angle would be next to impossible, and the lack of a flashlight will add to the difficulty. Furthermore, the TEENO Cordless drill comes with a 16.8v battery. Not a big difference in power and battery life, but it will certainly add up when you are handling bigger projects. Moreover, the overall design is inferior, with a harder grip and less finesse, making it an inferior choice. Overall, the Tacklife Cordless Drill Set is a welcome addition to anyone’s toolbox. While not the heaviest drill of them all, it’s a great little tool to have around the household. It’s great with wood and lighter materials, and it can also pack a punch when it comes to concrete and denser objects. It comes with a complete set of accessories, a soft grip, and flashlight—everything that one would need to get his or her hands dirty. Make sure to make good use of the two-year warranty and start drilling, hammering, or driving right away!